Design your own version of a hundred dollar bill and help end lead contamination of soil. Lots of confusing and conflicting information might make you miss your local Earth Day festivities. Here’s how to find out what’s happening near you. Looking for eco-friendly swag and specials? Look no further than these Earth Day deals! Want to sport an organic cotton t-shirt that displays YOUR favorite simple way for saving the planet? WE ADD UP is where it’s at! 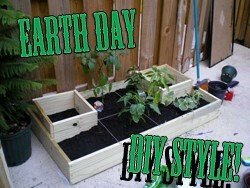 Looking for something to get your hands dirty with on Earth Day? Check out these 5 FUN and easy eco-friendly DIY projects! 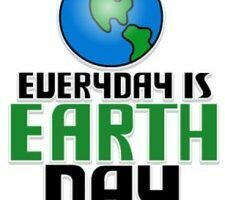 Green giant Grist.org says we should Screw Earth Day. Are they right or just being eco-snobs? Did you know that April is known as Earth Month? Here are 4 FUN ways you can celebrate it! 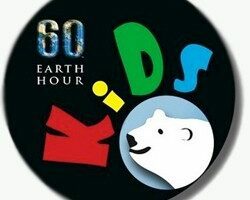 Calling All Kids: Guilt Your Parents Into Earth Hour With These Fun Activities! 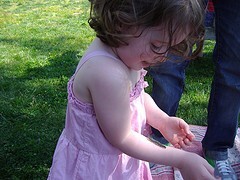 Want to know what you and your entire family can do for Earth Hour 2009? Here are some GREAT ideas! Waiting for an easier way to live greener before you start? Well this is your chance, take this challenge, win a prize, and live a greener life by Earth Day! The rundown on the features and benefits of Mozilla’s Flock Eco Edition browser! Now you can Flock yourself in good conscience. Teaching our children how to live green is the BEST way to change the world. I got to speak to an entire 3rd grade class about it, and they blew me away! 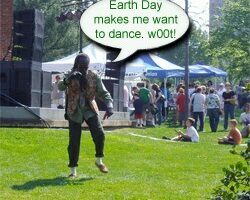 Dreadlocked dudes dancing, little girls and caterpillars, organic foods, and good tunes…Earth Day festivals sure are fun! Check out these pictures from my local Earth Day festival. Get some good pictures from a festival near you? Submit them to be featured on The Fun Times Guide to Living Green! 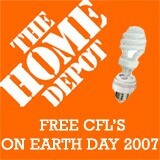 The Home Depot is giving away 1,000,000 FREE CFL’s on Sunday, April 22nd, which is Earth Day. Why not run out and grab one so we can save some money and the environment? EarthDay is upon us but so many don’t even know why. Get out and celebrate Earth Day at your local festival that you may not know is even happening…yet.